My workshop is finished, and it’s about time! Our move to Floyd included the target of building a workshop large enough to produce hand crafted designs in a more efficient manner. My tools have been packed up for five months and I have been itching to get the shop set up and get working again. I have been designing custom woodwork for almost three years under the Box-Carts label and it comes in as a close second to blogging as a source of personal satisfaction. Taking a client’s description of a need and creating a real-world design that meets their requirements is a challenge that always renews my spirits. After weeks of preparation, I finally started producing designs for clients again. This is the first design out of the chute – dog steps to make life easier for a client’s lame old dogs. 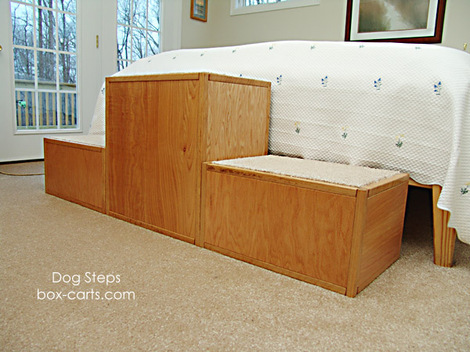 These photos show a series of enclosures made of oak that will allow her large, older dogs to climb onto a bed. The enclosures are constructed of 3/4 inch cabinet-grade oak plywood with solid oak bars framing all edges. The enclosures are completely finished inside and out and the tops are covered with beige carpet so the dogs will not lose their footing while climbing or descending the steps. The enclosures provide auxiliary storage space if desired, but as you can see from the photos, they can be positioned with the opening to the front or to the rear. Mixing the orientation provides an easy way to change the appearance of the final installation. The end result I look for is a clean and elegant design that is unique. craftmanship that makes it a delight to own. My designs are based on using solid wood and natural finishes whenever possible. Every design is oriented toward using efficient limited production techniques and I leave room for future modifications whenever possible. I feel that a good design should be reusable in as many new forms as possible. 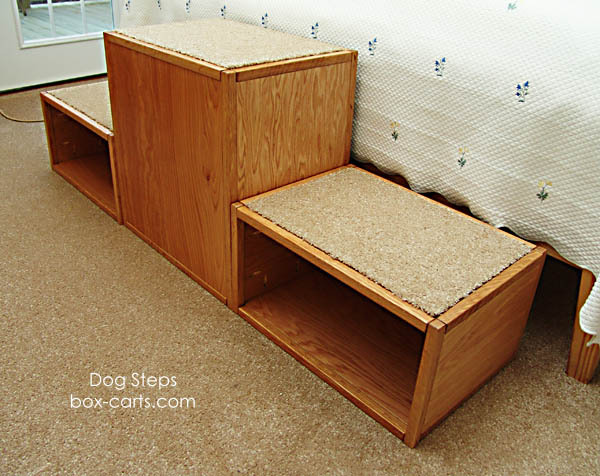 This dog step design produced an extremely strong box that can be positioned on any face and can be extensively modified to suit almost any requirement. If another client wants doors on this type of enclosures, it will be a simple matter to add them. These units are separate, but they can easily be fastened together with furniture bolts to make them into one large, rigid structure. The design can be easily reproduced in a variety of woods. Turn one of these boxes on its back and enlarge it, and you would have a sturdy toybox. Put casters underneath it and you would have a smart, but rugged rolling cart for firewood. I have one like it and it saves a lot of time because I can roll it to the door, load it with logs, and roll it back to the stove without leaving the usual trail of debris. If you are looking for something in wood and haven’t been able to find it in a store, send me an email. Maybe together we can come up with a design that will fill the bill. If you live on the other side of the country, I can generally propose a design that lets you do the final assembly yourself. To get a better idea of what can be done, check out my Affordable Design website. The Box-Carts workshop is open again and I am ready to make up for lost time. This entry was posted in Affordable Designs Wood, Country Living. Bookmark the permalink. 0 Responses to My workshop is finished, and it’s about time! Dog lovers everywhere will commend you for that design. Your work is beautiful; just had a wonderful time visiting your site. And I wanna see the workshop! Have you thought about bartering for services in the Floyd area? They are even better than I had envisioned and I think the dogs will be very happy to have them. Now I’m inspired to make a nice cover for the bed, just need to get the sewing room organized. Not mention the garage, office and kitchen! Bob and Kari Eich of Windy Hollow Construction are doing a good job of bring about some changes and improvements to the house and yard. Nice work, but one word of suggestion….dachshunds! I got a carpet covered plastic ramp for my mom’s 2 wiener dogs. No way they could use those big steps. For you I would design a ramp. 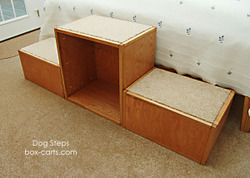 These are big dogs and the step size was dictated by the client. There is an infinity of designs to choose from. Every old dog , or cat, deserves the kind of assistance they need to climb onto the bed or couch they once assaulted with ease.